If you’re going it alone, i.e. you are considering purchasing a piece of land and planning on building a villa in Lombok, make sure you understand what its likely to cost to install the required infrastructure. Many sites in Lombok are ‘greenfield’ and don’t benefit from the type of government provided infrastructure you may find in your home country. The trap many find when building on their own piece of land and not as part of a managed development, is the cost of infrastructure can be overwhelming. Think drainage, electricity, water, waste, retaining walls (especially if you’re building on a hill) and access roads. Going it alone will reduce your ability to share these costs, so get quotes on these essential items before you focus on your house construction to ensure you have the budget to build a fully functioning home. We have been extremely lucky to have an experienced hardworking teams on-site, but we know others who build in Indonesia have not had such a positive experience. While we say we were lucky, we also made sure to do our homework. 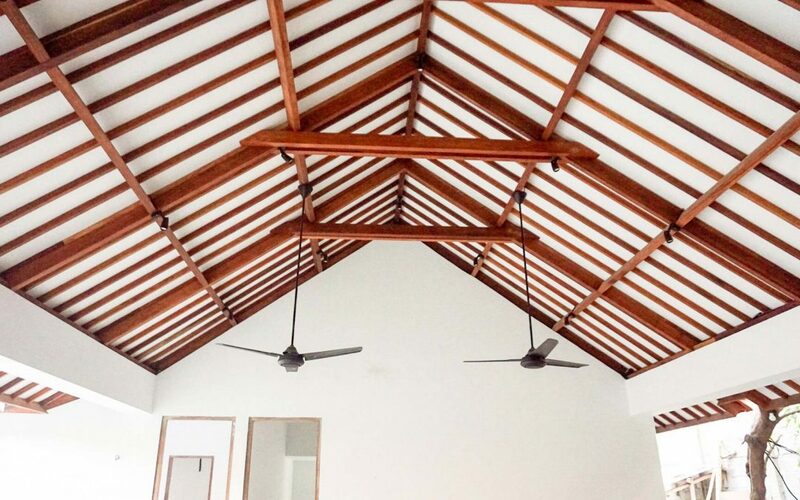 So our advice is this; before jumping in and building a villa in Lombok, take the time to view the building team’s previous work, confirm that specific team members will be involved from those projects and pay particular attention to who will do your plumbing and electrical work. No matter how much planning goes into your build we recommend you visit your site as often as possible to get the result you desire. This should be a prerequisite for a build anywhere, but many people in Lombok attempt to develop their dream home in absentee. We know living here for an extended period is not possible for everyone. If you cannot be in Lombok during construction but still want that awesome villa we recommend partnering with an experienced developer in the area or consider purchasing a completed villa. Why not sign up to our newsletter and receive regular updates on all things Lombok real estate. It may seem obvious but we can’t stress enough the importance of agreeing the building cost and contract terms upfront. Before we entered into an agreement with our builder, we went through several iterations of the quote. Confirming exactly what was in and what wasn’t and gaining an understanding of the type and quality of materials that would be used. Leaving your quote too vague just opens you up to problems in the future. Also check in with others who have used the contractor to ensure they delivered on time and on budget. Once you’re happy with the quote make sure you get a contract drafted up so that both parties are on the same page regarding payment terms, timing, retention and warranty. Tip 5: Enjoy the process! Our final piece of advice is to try to enjoy the process! Sure there will be mistakes and some things might not go exactly like your Pinterest board but there will also be plenty of days of excitement and pride as you see your dream villa develop. Indonesia has many skilled and extremely hardworking tradesmen who are a pleasure to work with, along with fantastic natural materials. We constantly remind ourselves how lucky we are to be able to build our dream villa in this most beautiful, tropical location! Hi Jean, sure we know the area well and are always happy to help where we can. We will be in touch via email. Thank you. Can you recommend a building contractor or team for building for a small house in Sandik Batu Layar? Hi, thanks for your comment. Sure, please send us an email at info@reefpropertylombok.com and we can provide further assistance. Thanks.